FOND DU LAC, Wis. – Ice cream is often a food that brings families together. 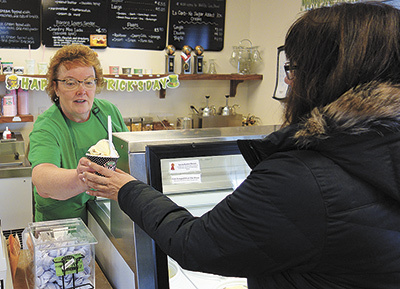 Karen Kelley can attest to this as owner of Kelley Country Creamery in Fond du Lac, Wis. Kelley serves the popular frozen treat to hundreds of thousands of customers every year. Seeing how ice cream helps people take a break from busy lives to reconnect with their families is one of the greatest joys of her occupation. The creamery’s ice cream is made with Grade A milk from the family’s farm which is just down the hill. Formulating the ice cream mix from their farm’s milk is a big part of what makes the ice cream so special. Kelley and her husband, Tim, have five grown children – Amie, Betsy, Heidi, Molly and Clark. Tim and Clark, fifth- and sixth-generation farmers, respectively, run the 65-cow, 200-acre Oak Lawn dairy farm, which has been in the Kelley family for 158 years. The Kelleys pasture their cows when weather permits, which Kelley said is important for milk quality and taste. The creamery makes more than 350 flavors of ice cream, including up to 20 seasonal varieties. Between 20-25 flavors are available at any one time, and flavors change on the fly. The one exception is Leo’s butter pecan, which was named after Kelley’s father-in-law. Kelley Country Creamery opened its doors on May 13, 2010, serving 70,000 customers that first season. Since then, Kelley said business has at least tripled. The creamery was featured on “Good Morning America” after being voted it to have the best ice cream in America in 2013. May through October is their busiest period, and, on summer nights, it’s not uncommon for the line to go out the door 100 people deep. The creamery serves around 2,000 customers on a typical summer weekend day. Attending conferences and seminars on value-add options, Kelley said she explored ideas such as bottling milk and making cheese before deciding to make ice cream. Getting the creamery up and running was a four-year process. Kelley researched and learned about ice cream making, including taking courses at the University of Wisconsin-Madison. When considering value-added opportunities, Kelley recommends seeking the help of relevant trade organizations. 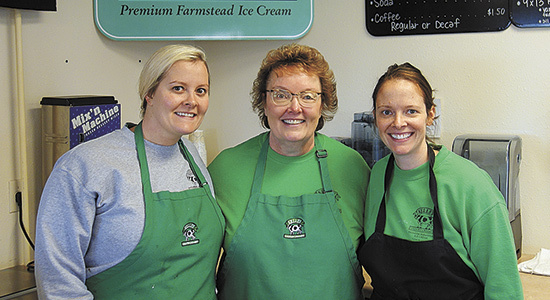 The creamery employs 30 people, including three of Kelley’s daughters. Betsy and Molly work at the creamery full time, while Amie works part time as the creamery’s manager of weddings and events. Brides and grooms looking for a spin on the traditional wedding cake can enlist Kelly Country Creamery to make individual ice cream desserts for their guests, such as diamond-shaped ice cream gems, chocolate marble tulip cups or three-tiered mini wedding cakes. The Kelleys also make custom ice cream cakes and pies for every occasion. The Kelleys enjoy inventing new flavors and are not afraid to experiment with bold creations. For example, blue cheese pear is a wild combination of pear-flavored ice cream, caramelized pears and Gorgonzola blue cheese crumbles. Maple bacon is made with local maple syrup and caramelized bacon from a local meat market. The perfect breakfast ice cream might be barnyard bash, made with maple walnut ice cream and pieces of pancakes, waffles, French toast and walnuts. Moo luau is a summer seasonal that satisfies the craving for a sundae with its banana split and vanilla ice creams loaded with strawberries, bananas, pineapple, chopped nuts, a chocolate swirl and Maraschino cherry halves. While robin’s egg, a blend of vanilla malt and speckled malted eggs, is a tempting Easter treat. Even with all the flavors to choose from, Kelley’s favorite is vanilla. “You have to have a good vanilla in order to make the rest,” she said. The creamery’s ice cream is not found in grocery stores or other retail locations. Kelley was offered national distribution following her appearance on “Good Morning America,” but she declined. Located less than one mile from Interstate 41, the creamery’s primary customer base stretches a 150-mile radius. Many of their customers are local, but the creamery does attract ice cream-lovers from all over the country and even faraway places like Germany and Japan. Most people discover the creamery by word of mouth, but Kelley also uses her website, Facebook and Instagram to promote the creamery. The creamery features outdoor seating, including picnic tables and a sun porch lined with white, wooden rocking chairs – the perfect spot to enjoy an ice cream cone while soaking up the countryside and pondering what new flavor the Kelleys will come up with next.